If having the biggest selection if high on your list of priorities when you are deciding which online retailer to go with then Eyeglasses.com should be your go-to retailer. Eyeglasses.com not only has a massive selection of frames, but they also have a very large selection of lenses as well. 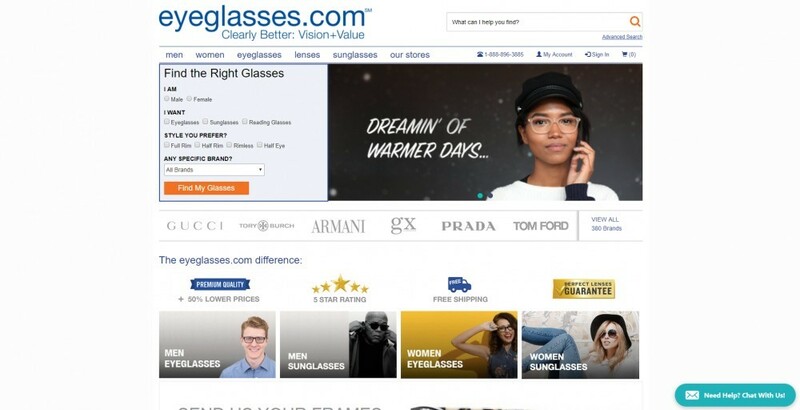 Most online retailers will give you one option for each type of lenses, but at Eyeglasses.com they carry multiple different brands of lenses in the same lens material. Which gives you the ability to be able to decide for yourself if you want a higher quality lens. One of the major limitations in going to a physical retailer to purchase your glasses is the fact that their selection is going to be limited essentially by what they can fit into that store. Eyeglasses.com pretty much puts that limitation to rest by offering a massive selection of frames, one that even outshines other online competitors. If you are someone who likes designer brands, their selection of frames includes more than 380 of the most popular designer brands. From those, you can find anything from the latest fashion trends all the way to your classic vintage and retro frames. The reason that Eyeglasses.com is able to offer such a large selection of frames is due to them using “virtual inventory”. Instead of carrying all of these frames in a warehouse if you order an item that is virtual inventory, Eyeglasses.com calls their supplier and has the frame shipped from the supplier to them. This gives them the ability to offer such a large selection of frames for you to pick from. Keep in mind that if you order something that is virtual inventory it does take an additional couple of days for your order to arrive. Looking through the selection of frames at Eyeglasses.com can be a daunting task due to the number of frames in their selection. With a selection so big, the only way you will be able to see all the frames that you want to see is by using the filters to narrow down the frames to a more reasonable selection. The frame filters at Eyeglasses.com isn’t quite as detailed as what I am used to seeing at other online retailers. You can narrow down the frame selection by shape, material, gender, brand, price rim, eye size, and category. While they do have a decent selection of filters, I would like to see color as an option. It would be quite difficult to go through thousands of frames looking for specific colors. Another issue with the frame filters is the “Eye Size” filter. The Eye Size filter is the filter that you would use to filter out frames that generally would be too small or too large to fit your head. Eyeglasses.com has the frames filtered by the size of the lens which really isn’t any help if you are trying to figure out if a frame would fit without being able to filter out the bridge size as well. Plus having the lens size is just too confusing for your average consumer and having frames categorized by small, med, and large fit frames would be much easier. Aside from those two issues, you can still significantly narrow down your selection based on the filters they currently have. The easiest way to find a frame is if you already know the model number, which you would be able to type into the search bar to easily find your frame. Once you have settled down on a frame, now it is time to look at lenses. Single Vision Distance – These lenses have a single power throughout the entire lens, and is used to be able to see things that are far away. Progressive – These lenses are also known are no-line bifocals and have three ranges of power throughout the lens. Progressive lenses start with your distance power on the top and blends down to your intermediate which is about the range of a computer, and on the bottom is your reading. All three ranges are seamlessly blended. Lined Bifocal – These lenses give you the ability to be able to see far as well as look down and be able to read. The difference between the lined bifocal and the progressive bifocal is on the lined bifocal the reading area is distinct and visible. Lined Trifocal – These lenses are similar to the lined bifocal, but instead of only being able to use it to see far as well as up close lined trifocals also have an intermediate range in between for use on the computer. Similar to the lined bifocal, these lenses have a distinct visible area for the intermediate and reading areas. Reading & Computer Vision – These lenses are similar to how the single vision for distance lens is but instead of being tailored for distance these are made for reading OR computer ranges. No Prescription – For those of you who do not need a prescription for your glasses and are planning on using them for cosmetic purposes you can choose to order your glasses with no prescription. CR-39 (Plastic) – These are generally the standard lenses that you can find for your glasses. Plastic lenses provide you with the best optical clarity when compared to the rest of the plastic-based lens materials. However plastic lenses tend to be more vulnerable to scratches and can chip or crack. Stronger prescriptions tend to be thick as well. High-Index 1.59 Polycarbonate – These lenses are usually known for their safety properties as they are impact resistant and do not chip or crack easily. These are ideal lenses for children, active adults, as well as sports and word safety. Polycarbonate lenses are thinner than standard plastic lenses and are more resistant to scratches. Ultra High-Index – These are the thinnest lenses that are available for your prescription lenses. These are ideal for individuals who have stronger prescriptions and want their lenses to be as thin as possible. These are the most scratch resistant lenses when compared to other plastic-based lenses. Trivex – These lenses like polycarbonate lenses are known for their safety properties. Trivex lenses are generally ideal for anyone purchasing rimless frames. These lenses have slightly better optical clarity when compared to polycarbonate and are similar in thickness. Glass – This is the lens material that will give you the best optical clarity of any lens material. Glass lenses also benefit from being far superior in scratch resistance. The drawback to glass lenses is the weight and thickness of the lenses, as well as the vulnerability to chipping and shattering. Sun-sensitive Transition Lenses – These are your photochromic lenses in which darken when exposed to UV rays. Eyeglasses.com carries the Transitions brand of photochromic lenses just like most retailers do, but the big difference here is that they carry four types of Transition Lenses. They have your standard Transition Signature lens that most retailers carry, but they also have the really dark XTRActive lenses, the Vantage polarized darkening lens, and the Transitions Drivewear designed for driving in low light conditions. You have many options, but it boils down to what you are going to be using for glasses for. Some Transition lenses are not available in all lens materials. Tinted Lenses for Sunglasses – If you are looking to get prescription sunglasses then this is the way to go. Tinted prescription lenses can provide you with comfort from the bright sunlight as well as protect you from the harmful UV rays from the sun. You have many options for color and shade options to pick from but you can put in a special request if you want to. Eyeglasses.com is able to accommodate most special request for tinted lenses. Polarized Sunglasses – If you want an additional level of protection from sunlight, polarized lenses can give you protection from the harsh glare reflecting off of horizontal surfaces such as large bodies of water, the ground, sand, or the hood of a car. You can get polarized lenses in gray, brown and green, some lenses come with an anti-reflective coating for additional protection. Polarized lenses cannot be customized in different shades. Edge Polishing – This add-on can make the edge of your lenses look polished and clear. Generally used for rimless frames and semi-rimless frames but if you have a strong prescription, edge polishing can help the edge of the lens look less noticeable. Flash/Solid Mirror Coating – This is a coating that can be applied to your glasses, and can provide protection from glare coming from the sun. The Flash Mirror is light and your eyes are slightly still visible while the solid mirror your eyes are not visible. Eyeglasses.com offers free standard shipping if you live in the United States and your order is greater than $55. For International customers that live in China, Canada, Australia, and most European countries you can get free standard shipping if your order is great than $100. International shipping is available to other countries as well, just not with free standard over $100. They also ship to APO and FPO addresses. The amount of time that it takes to get your glasses depends on which frame you ordered, what type of lens you ordered and your shipping time. Processing time varies between 3-5 days depending on your prescription, but if you pick a virtual frame you will need to add 2-5 days to that. The return policy at Eyeglasses.com is definitely not one of their strong points. They offer a full refund for frames and sunglasses, but if you order prescription lenses and you want a refund you only get 50% of what you paid for your lenses back. Although they do guarantee that your prescription will be made correctly, and if you need to change lenses you can have it remade once as well. There is no mention of any warranty of any sort, but most of the time the frames will have at the very least a manufacturer warranty that would cover any defects. They also do not cover return shipping, therefore if you have issues you will be handling the cost of returning the glasses to them. Replacement Eyeglass Lenses – Save 40% Off Retail Prices! Eyeglasses.com definite a unique retailer with that remarkable selection of frames that truly stands out from other online retailers. Not only that, their selection of lenses as well as various add-ons for the lenses is far superior to many other online retailers. Even if you aren’t looking to fill your prescription at Eyeglasses.com, they are still a great place to search for those perfect frames. Thanks for stopping by Eye Health HQ and if you have any questions don’t hesitate to drop a comment below. If you enjoyed the article, you can share this article through your favorite social media channels with the buttons located right below. Thank you for your support!